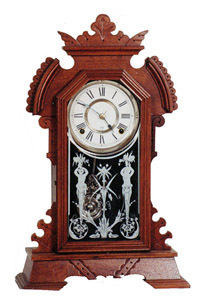 Ansonia Clock Co. walnut mantle clock, "Ohio", ca 1891. 8 day, striking half hours. 22 inch walnut case is clean, near perfect. 75 % of label on the back, original pendulum and glass. Paper dial is probably a replacement. Ehrhardt, Book 2, page 21.